Story by guest blogger Julia Munroe Martin. Photos Copyright © Milli Thornton and Julia Munroe Martin. 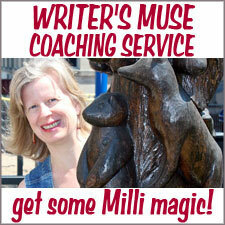 Preface from Milli: My guest blogger today, Julia Munroe Martin, is an online friend. I first read this story on her writing blog, wordsxo, exactly one week ago. Not only was I enchanted with her story, but it just so happens I live only one suburb over from Poland. (We’re in Youngstown, 80 miles SE of Cleveland, Ohio.) Naturally, that called for a field trip and some up-to-the-minute photos. Julia and I had a blast co-producing this version of her original blog post, and we’re hoping you’ll enjoy this combo of old-fashioned vacation news and modern-day small town adventure. Over to you, Julia. . . .
AS A CHILD I moved frequently. With my parents busily pursuing their careers as college professors—including year-long trips to Kenya and Belize where they conducted research—we moved from place to place. It may sound glamorous—but to a child? This child? I had no place to call home. The closest I ever felt to home was with my grandmother at her house in Poland, Ohio, on the banks of Yellow Creek. I’ve tried to recreate that feeling throughout my life—it’s one of the reasons I now live in a small town in Maine, 20 minutes outside Portland. I love that in my small town I can walk to many places—like I did in Poland. But for my grandmother, walking places was a necessity because Grandma (“Ohio Grandma” as we called her) didn’t drive. Luckily, a quick walk across the bridge took her to every small-town amenity you would ever need. 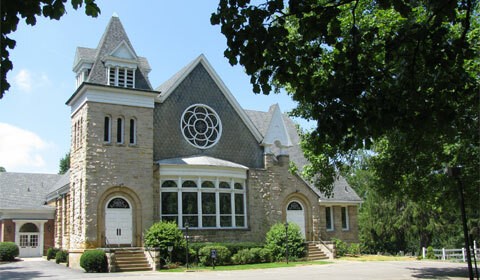 We walked all over town together: Isley’s Ice Cream, the post office, the small grocery, the library across the creek, her neighbor Mr. Steinfield’s house with all its clocks, and to church on Sunday. She was from a different age and time, and when I was with her, I wished and hoped with all my might that her life would be mine. 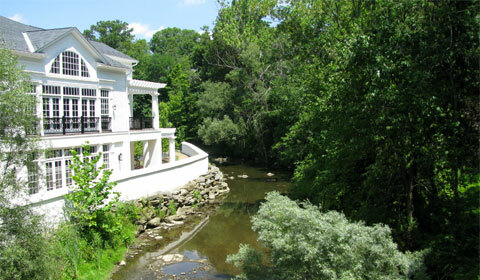 Her house on the banks of Yellow Creek was surrounded by gardens: vegetable, flowers, fruit, lush vegetation. Everywhere some small plant was tucked, a lovely flower or delicious berry treat. And it was here, in her beautiful world, I learned gardening basics: what plants grew where and how to care for them. To this day I cannot see some of her favorites—Black-eyed Susan, Lunaria (money plant), Swiss Chard, or Queen Anne’s Lace—without thinking of her. But more, my grandmother taught me about what growing things need: vegetables and flowers, small woodland animals, and people too. Every night I would lie, safely tucked into the small Jenny Lind bed in the tiny bedroom under the eaves—and I felt like one of her little plants: safe and secure. My bedroom window looked out over Main Street as well as the bridge over the creek. As I lay in bed, I could hear cars rattle over the bridge and trace their headlights across the flowered wallpaper, the same wallpaper my mother grew up with. With each set of headlights, I’d wish with all my might that it really truly was my home. A newspaper clipping from a family history put together by Julia's uncle. 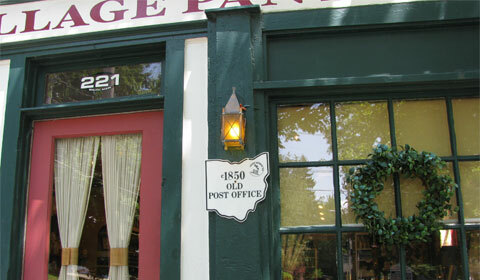 The Ohio-shaped historic marker on the porch says Woodruff Foundry 1850. In the morning, we’d sit and eat our toast at her kitchen table. Together we’d watch the birds on the birdfeeder outside the window. She loved all the birds that came to the feeder (and even the squirrels that raided it, too!) and so began my lifelong interest in birds. Chickadees, Jays, and Cardinals—these favorites remind me of her. Look closely! 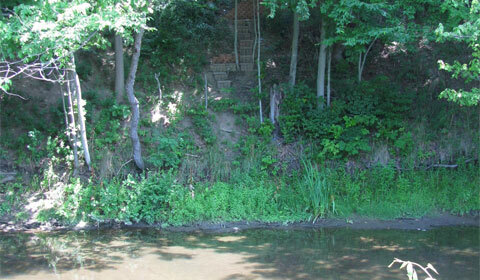 Steps down to the creek near where the old house used to be. 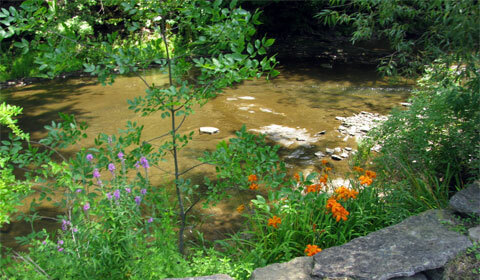 The creek was a favorite spot to catch tadpoles, build dams, and place stepping stones. When Julia's grandma lived there, her gardens went right down to the creek's bank. Later, after a day of gardening and building dams in the small creek, we walked into the small village of Poland. Hand-in-hand, down Main Street toward the center of town, my grandmother would stop to greet each person by name and introduce them to her granddaughter. As we walked she told me stories about my mother when she was my age, about her friends and all their adventures. Grandma and I shared a love of reading, and one summer I was excited to find that the Poland Public Library had relocated to right across the creek from my grandmother’s house. We visited the library often, sometimes everyday—all we had to do was walk across the Main Street bridge. I even had my own library card! For two glorious weeks each summer I was lucky enough to be a part of my grandmother’s life. And during those two weeks she taught me about gardening, bird watching, cooking, and a little bit about life, too. But mostly? She taught me about home. Afterword by Milli: As you can imagine, I was thrilled to live close enough to Poland, Ohio to collaborate on expanding Julia’s story. But once I arrived in Poland it got even better. The locals were super-friendly: I was soon immersed in the library scene and being urged to attend a popular Friday night social event. The locals even wanted to help me move from Boardman to live in Poland! Far from the 30-minute trip I thought I was doing to grab some photos, I was gone for hours . 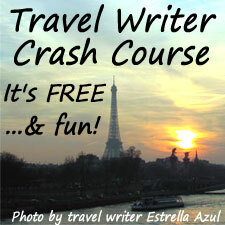 . . and my adventures will result in several more stories for this blog. 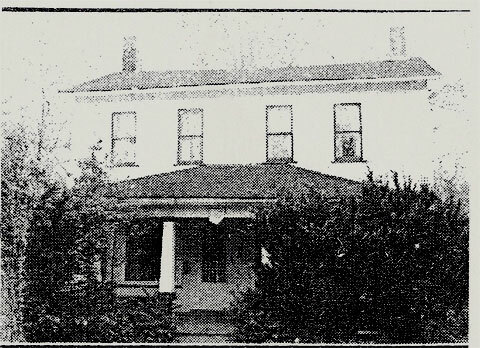 One of the most fulfilling moments was when I located the old house by looking for the Woodruff Foundry 1850 historic plaque (mentioned above in the caption for the newspaper clipping). You just never know what adventures await you in your own backyard! 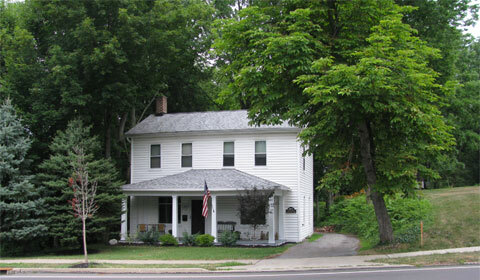 The old house is still there. I found it by looking for the historic plaque. 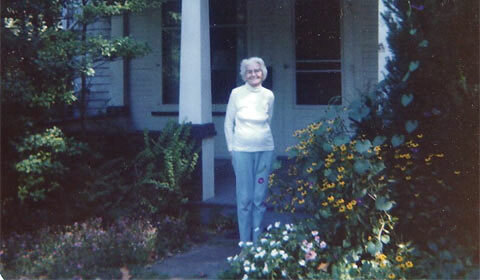 JULIA MUNROE MARTIN lives in an old house in a small town on the coast of Maine, about 20 minutes outside of Portland. She comes by her wanderlust naturally: born in France, she has also lived in Massachusetts, California, Colorado, Belize, Kenya, and Uganda (with brief stints in Minnesota, Ohio, and New York). Julia is a freelance writer and editor in the private, public, and nonprofit sectors; she writes fiction and creative-nonfiction; she blogs at wordsxo and tweets as @wordsxo. I love this! Julia – I read the blog and you painted such pictures with your words – the actual pictures are beautiful Milli….it brought the whole thing together! I love that you read her blog and thought…ROAD TRIP! Such beautiful photos and words. Thanks for sharing with us! I want to visit that beautiful house. Glad you enjoyed the post and photos, Leah! Thanks so much for finding me at Milliver’s Travels! What a wonderful collaboration, ladies–and those pictures are fabulous. Glad you found me at Milliver’s, Erika! And I’m glad you enjoyed the post; it was great fun to collaborate wtih Milli. I love this expansion of your story, Julia and Milli! Being one who grew up right across from the Ohio border, I am intimately familiar with all of the towns you mention. I went to college in Alliance, often met my friend from Lisbon IN Boardman, traveled through Poland many a time, attended the Canfield Fair and have been to Youngstown too many times to keep track. MY grandma also lives in the Warren area – near Niles. Your visit and photos enriched Julia’s already-fantastic post! Thanks for sharing, ladies! That’s so amazing that you grew up and lived so near to Poland, Melissa! Funny to think we were probably there at the same time and may have crossed paths! I’m glad you enjoyed Milli and my collaboration to expanding the story! Wow, Melissa. You do know this neck of the woods (probably much better than I – we’ve been here less than three years). I always think of Y’town as such an out-of-the-way place, it’s amazing to know two people online who have direct ties to here. In fact, three. Just found out yesterday one of my coaching clients has been here to visit her BIL who lives in Boardman. I know what you mean about no place to call home. We moved many times( not as far as you though) when I was young. I have lived in N.J., Cal., and many places in N.Y., all before I was in High school!Then moved quite a few times after I got married, But, I LOVE to travel! so its all good! Betsy, So glad you enjoyed the story! I love traveling, too, but I have to admit that I’m pretty envious of people with deep roots, too! You sound like you hit states I missed, with NJ and NY! Thanks so much for the comment & the visit — so happy to meet a fellow traveler! What a great little piece about the old home and small town USA. When I was in US, I steered away from the biggies. I think Salt Lake City was the biggest. I just love the ambiance of the small towns; much like here in Oz. I’m surrounded by them, everyone with a wealth of history – well, 223 years at least. Now, thanks to the photo, I know what a ‘black-eyed- Susan looks like. Thanks Leigh Ann; glad you enjoyed it! What a beautiful place an awesome grandmother and what a lovely description of it all! Home is both a tangible structure of beams and rods and oh so intangible, something that is just felt and can never be fully described. PS That house is absolutely stunning! Aisha, I’m so glad you came by to read about my grandmother and what I wish I could call home! I appreciate your kind comments and your reflections on the concept of home. As for the house, I was so happy to see that it has been restored to such a beautiful state — as my grandmother aged it became more and more difficult for her to care for it. She would be so happy to see it looking so well cared for! And I LOVE this collaboration, Milli! It’s so neat to see all the places Julia wrote about. Great post, you two! Barb, So happy you enjoyed my memories and Milli and my collaboration! It’s so interesting that you have the roots I longed for but not the grandparents I had — I guess we all have things we long for. I’m glad I could share some of my memories of my grandmother with you; and I’d love to hear about your deep roots some time! Barb, Thanks for the great comment and I’m so pleased you enjoyed our collaboration! Your comment really verbalized something for me, too. I grew up in a stable environment in Great Falls, Montana — and then got uprooted at age 12 when we moved to Australia (where I stayed for 25 years, albeit I moved around A LOT). But, like you, I did not have any grandparent experiences in my childhood. I was the 7th of eight kids and by the time I was born all my grandparents were either deceased or in a nursing home far away. Strange how I didn’t quite put my finger on why (among other reasons) Julia’s story grabbed hold of me till I read your comment. I guess I’m just so used to being without that part of what’s considered a normal childhood. Delightful! I was just over there today, admiring the historical homes. This is practically my backyard! Bt the way, still the quaint, small village appeal. I’m so happy you commented! I think about my grandmother and her house so often — especially right now as the Black-Eyed Susans bloom in my garden! Thank you for reading and commenting, nice to hear you enjoyed it. I loved reading this!I grew up in Poland, Ohio…upon graduation, I went away to college and always longed for that same feeling you express so well. A few years ago I had a baby and told my husband, “I want her to have those same experiences I had growing up in Poland, Ohio”. He loved me so much we uprooted our lives in Columbus and I took my family “home” to Poland, Ohio. I walk along the small town streets with my four-year old and get that same old feeling again. Thank you again for this precious story. I’m so glad you enjoyed it, Rachel! I think about walking along those Poland roads with my grandmother — and I’m so glad you get to do that with your little girl! What a wonderful gift to give her! Thanks for reading and for the comment. What a great post. Many of my fondest memories growing up were visits with Grandma. I have owned the “1850 Woodruff Foundry” since 2006 and my wife and I look forward to raising our new baby daughter here in Poland, OH. We would love to see any additional photos or history you may have of the property?